"It is so hard to find good information, let alone get hands on experience, and your course provided both." Thank you very much for a Fantastic day at your farm. You and your husband are very knowledgeable about goats and your expertise comes through very effectively. We very much enjoyed the practical sessions because we could actually get hands on experience which is what we need. "Thank you so much for a fantastic day on Saturday. Not only did I learn a lot, but I thoroughly enjoyed the day as well"
"I just want to let you know how much we enjoyed meeting you and how much we valued the 2 days you spent with us. Your knowledge base is quite remarkable and we feel extremely lucky to have had the opportunity to learn from your experience." Saturday 23rd & Sunday 24th March 2019. If these dates do not suit you please ring or email info@goat-meat.co.uk to discuss your requirements. 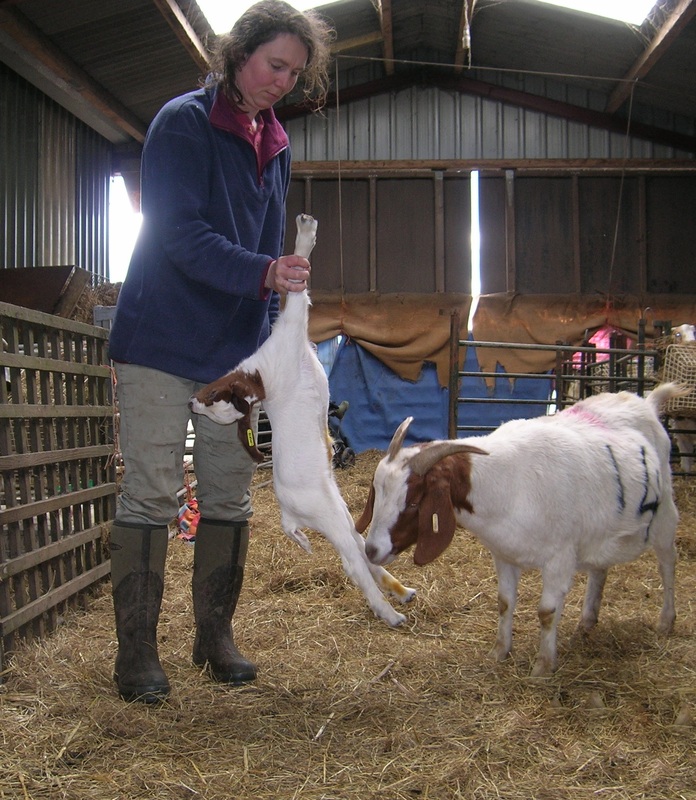 Our courses are run within our well known commercial meat goat herd, one of the countries longest established, and are ideal for those new to livestock or goat keeping. They are especially suited to those thinking of starting a small holding or small farm however also suit people thinking of owning a couple of pet goats. Our basic course covers such aspects as the rules and legalities, basic handling skills, feeding, medication and foot trimming. Also choosing meat breeding stock and meat production. Sorry, we don't cover milking. Kidding days cover the full breeding cycle from pre tupping through to the first few days of the kids life. Although we don`t guarantee you will see a birth we plan these days round our busiest time to give the best chance. 2 day courses in kidding season cover all the aspects from both courses. All courses are very hands on and are designed round those present to ensure each individual gets as much from the day as possible. Courses can be tailored to your needs and are for individuals or small groups only meaning you receive our full attention. Starting at 9.15 am and finishing soon after 4pm you can get as involved in the daily care of the animals as you wish. Each course has a maximum of 8 people unless booked as a group. Now also available, a great follow up to the basic day course. Experience a day working at the farm, Come and see first hand the activities of an average day on the farm. Do morning rounds, a day of typical jobs and finish off with evening rounds. The contents of this website are the property of C & S Peacock of Cockerham Boers and goat-meat.co.uk. They should not be reproduced in any way or format without prior consent.